Many new parents are surprised to find themselves feeling helpless when their baby first arrives. However well you prepare for your baby’s arrival, it is common to lack confidence or to worry that you don’t know what to do. There are thousands of books which will confidently tell you precisely what your baby needs; apps to keep track of whether you and your baby are doing the right things at the right times; healthcare professionals with charts and lists of milestones to tell you how your baby should be developing; family, friends and even strangers may be telling you how to take care of a baby and what you shouldn’t do. However well-meaning all this advice and support, it can often feel like you are being told that you’re wrong, told that you don’t know anything, or criticised for the choices that you are making. Sometimes as mothers we can feel criticised even when nothing is being said at all; the very fact that other people choose to parent in a different way can make us feel like they must think we are doing the wrong things. Or you can just smile, thank the person for their support, and change the subject to a less controversial one. If the criticism or disagreement comes from people close to you, it might not be as simple as moving the conversation on to an easier topic. You may well want the important people in your life to support and encourage you as a mother, and differences of opinion can really get in the way of that. Also think about what you want to get out of the discussion. You might be having this conversation with somebody like your partner or a grandparent who regularly takes care of your child and treats them in a way that is different from your own parenting style. In that case it could be important to you to persuade this person to change their opinion, or at least their behaviour, so that your child is not treated in a way that you find unacceptable. However, in many circumstances it is not necessary to try and persuade another person that you are right. Particularly if you are talking to someone who has treated their children in a very different way from you, trying to persuade them that they have made mistakes as a parent may not be constructive. It can be helpful to bear in mind that the person talking to you may have raised children many years ago, or in another country or culture, and the advice they were given about how to treat children could be very different. You may be able to find ways of acknowledging that they did their best with the information they had at the time, just as you are trying to do now. Sometimes a healthcare professional may suggest approaches that you are not comfortable with, or may disagree with decisions you take as a parent. This could be anything from a health visitor suggesting early introduction of solids to a doctor prescribing a medical intervention that you do not want your child to have. Many parents find it hard to speak up when they are being given instructions by someone who has some kind of authority; it can help you to feel more confident if you prepare in advance, take someone with you for support, or put your concerns in writing if you find that easier. Ask for information: what are the expected benefits of the suggested action and how likely are they? What are the possible risks and how likely are they? What are the current evidence and best practice guidelines in this area? What alternatives are there? Is it possible to get a second opinion? Offer information: talk with your healthcare professional about any information you have and where it came from; look for respected sources of information such as medical journals and NHS guidelines. Give any background information that you think may be relevant (such as “my first baby was also on the 5th centile for weight at this age”, or “we have a family history of allergies and eczema”). Remember that healthcare professionals have good intentions and want the best for the children they work with, even if you disagree with their views. Healthcare professionals have experience and training in their specialism; you have expertise and experience with your own child. Working together and using their medical knowledge and your understanding of your child can help everyone to find the best possible course of action. Parenting can be tiring and difficult, and feeling criticised or unsupported by people around you can make it harder. It is important to take care of yourself, and to find ways to let off steam or wind down. It can be really good to have at least one supportive friend or relative who is willing to listen to you without judging or making suggestions, and to support you whether or not they agree with all the decisions you make. You may have other ways of dealing with stress – through exercise, creativity, relaxation; it can be hard to continue taking care of yourself in these ways once you have children to look after, but spending some time on your own wellbeing can really help you to be the kind of parent you hope to be. 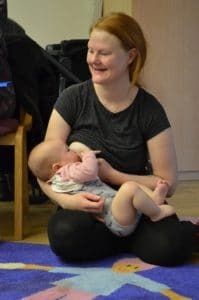 And don’t forget that you can contact other mothers through La Leche League, whether by speaking to a Leader on the helpline, attending a meeting of your local group or joining them on social media. Our aim is to provide mother to mother support, by listening without judgement and providing a welcoming atmosphere, whatever your choices and experiences.